Cable TV is declining; and over-the-top media services like Netflix, Hulu, and Amazon Video are growing. Across these companies, which OTT media service subscribers are the most loyal ones to their brands, and what are their satisfaction levels? Amazon has invented the MVP of the Future of Retail, and it looks terrifying for traditional brick-and-mortar retailers. What are the reasons making Amazon Go the future, and what can retailers do about it? Amazon has made unusual moves in the last couple of months. The e-commerce giant was blinking on the traditional grocery shopping market for years now, but now, the eye is not blinking, but staring at it. We knew Amazon was investing in grocery shopping via Amazon Fresh and Prime Now, where users are enjoying ordering their groceries in a super easy and lightning-fast way. 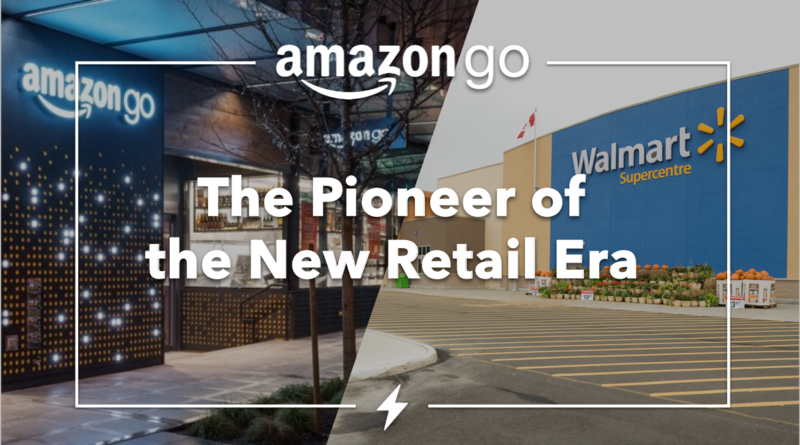 But, Amazon took bold decisions, where one of them is acquiring Whole Foods in June 2017, and made another interesting move in January 2018 with opening a new automated grocery store came from the future, Amazon Go. Amazon Go is a new retail store concept by Amazon, which is open in Seattle. Opened in January, Amazon Go provides a seamless in-store grocery shopping experience for shoppers. It is the most comfortable shopping experience of all time. Shoppers enter the store by scanning the Amazon Go app on their smartphones and start shopping right away. After shoppers find the products they want to purchase, they just drop the items to their bags and get out of the store without touching anything, or making a payment using a POS machine that cashier holds to them. Cameras at the top of the store and smart sensors at the shelves understand which products are purchased by which shopper, and bills the products bought from the store automatically. For Amazon, Amazon Go is an important step. 91% of the spendings in the US are in physical stores. Size of offline retail is ~$4.5 trillion, where online retail is ~$409.2 billion. Considering that, Whole Foods and Amazon Go will enable Amazon to steal more market share from its brick-and-mortar competitors and allow Amazon to increase its revenue. It will be the first step for Amazon to better leverage the data they have collected from Whole Foods and combine and smarten that data with Amazon Go transactions of shoppers. Amazon will be smarter and smarter every day, which will improve the experience of Amazon Fresh and other Amazon e-commerce channels, and in-store experience within Whole Foods. Amazon Go is a portal to the future of in-store shopping. It touches every pain point of a consumer on in-store shopping, and it fits directly to the lives of the next generation of shoppers. This will positively affect Amazon brand and will allow Amazon to touch more and more consumers by influencing the market. What is right about Amazon Go, and how it affects retail? Amazon Go is genuinely spectacular. With its Orwellian camera infrastructure, and magical mechanics working when shoppers are shopping, Amazon Go provides many learnings on the future of the retail. Amazon Go fixes the waiting lines. Since the payments are automatic, there are no waiting lines, and shoppers enjoy having that experience. Amazon Go enhances the shopper comfort, coming from accessibility and pleasant shopping experience. With Amazon Fresh and Prime, you can order your groceries in your home with a few clicks -or a few voice commands thanks to Alexa-, with Whole Foods, you can reach to thousands of high-quality SKUs with reasonable prices, and with Amazon Go, you can just enjoy having a super fast and neat shopping experience. It covers all your needs, 360-degrees. Whenever, whatever, and wherever you want. We have seen experiments in retail technology. However, this time, retail technologies are not only for analytics purposes, but it is for shoppers to have a better experience. Amazon Go shows real use-cases in retail tech other than self-service checkouts. Just like self-service checkouts created a breakthrough in the market, these new retail technologies will start changing the shopper behavior as we know it. Amazon is excellent at logistics, they already have nailed that. Thanks to auto checkouts and auto identification at the Amazon Go stores, it is operationally efficient. There is less amount of human work that is needed. Since the operational costs are lower, product prices will decrease. Hence, the market will have a shift towards discounts; or premium experiences. Amazon Go potentially can shift the importance of elements in the retail world as we know it and can push the traditional market to change. Amazon Go, Whole Foods, Fresh, Prime, Alexa; they are all connected with each other and helps consumers fulfill their needs with a great experience. Amazon Go shows the importance of integrations, and covering shopper needs at every stage they are in. Otherwise, brands who will not be able to implement sticky loyalty programs will have a hard time moving their customers to their e-commerce areas. The future of retail is here, and Amazon Go is the real MVP. What can traditional retailers learn from it and do about it? Walls of commodity started to crack. 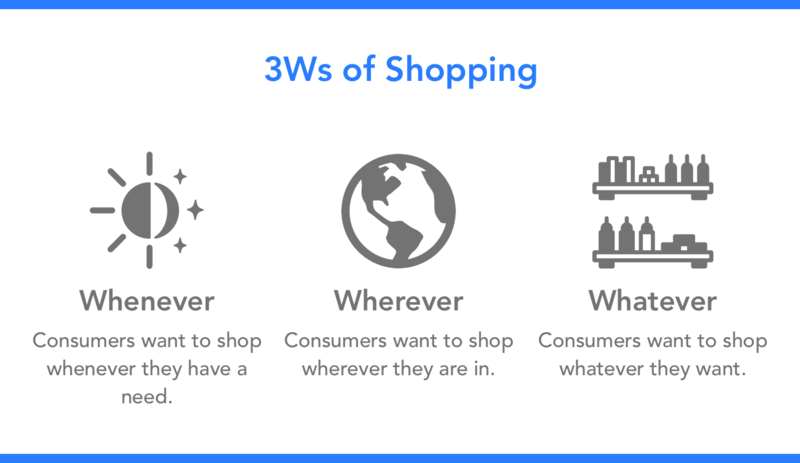 Amazon provides 3Ws to consumers; whenever, whatever, wherever. 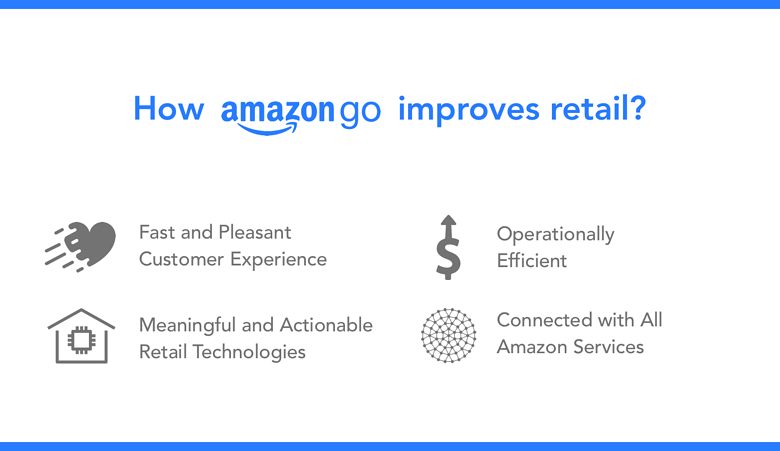 With these Ws come together, Amazon is preparing to disrupt and change the retail industry. We saw innovations in the retail world in the past, especially on payments. Users were paying by cash in the very beginning, and then we met with POS machines, where we were able to use our credit cards for payments. It enabled us to be agiler, and then, we have faced with self-service machines at grocery retails where we were freed from engaging with cashiers and store staff. Now, Amazon Go revolutionizes this area, which makes shoppers freed from paying physically, with complete automation. This is just one of the items. Thanks to the Amazon Go app, users can keep track of their purchases without getting a physical loyalty card or anything that needs to get into our pockets. Users can see what did they buy, can rate these products, and thanks to Amazon's integrations, they can order them from Amazon Fresh and receive them within a couple of hours. There are several things retailers need to work on to compete with Amazon and get ahead of the competition. Moving customer loyalty to the next level. For sure, it is essential to optimize the operational processes to reduce the costs and play the discount game to compete. However, within the experience economy we are in, it is hard for brands to sustain their revenue growth. Brands need to provide a good customer experience, and build customer loyalty programs by better understanding their customers and implementing sustainable programs for them. Covering customer needs 360-degrees. Even though brick-and-mortar will not die in a short time, for sure, it will evolve and will start losing its share to e-commerce. To stay healthy on this shift, retailers need to provide customers agiler and more automated options with a good and seamless experience. Integrating these alternatives with loyalty programs will make customers retain on their current provider. Building strong brands. Every market reaches commodity sooner or later, and the commodity breaks with the entrance of disruptors. The story of Netflix and Blockbuster is still in our memories, and it is traumatic. To stay alive on this shift, companies need to build strong brands. For sure, brand building is not one pillar alone by itself, but it is a mix of several items. Therefore, the strategy should be well-designed and include customer-driven tactics. Improve retail experience by implementing retail tech. Amazon Go's primary value proposition is providing a seamless experience, and that seamlessness comes from the retail tech elements it includes. Experience is not a one-way road, but it has several items - therefore, retailers need to understand shoppers' pain points and integrate smart retail technologies to fix those. Many other actions that can be taken, but the way market moves shows us these items are the most important ones. If Amazon continues investing in Amazon Go and starts increasing its coverage along with embedding these technologies to Whole Foods, traditional companies will continue bleeding more, and Jeff Bezos of Amazon will be the primary hero of this new tale, just like Reed Hastings took the central role in the story of 'The Dawn of Blockbuster'. If you want to learn how to achieve these goals and be customer-driven, go to www.twentify.com, and check our solutions and methodology. If you want to go further and learn more about the details, send us a message. Co-founder and CMO at Twentify. Leading marketing at Twentify, and fixing the way brands understand consumers and shoppers. Subscribe to Twentify Blog, and get our best content related to your interests and career.